The poster that stood out the most to me at the gallery was the AIDS Hidden Danger poster by Cedomir Kostovic. The pattern really caught my attention, and from far away you couldn’t even tell that it said AIDS on the poster, you only could see it when you got very close to it, which I thought illustrated the concept perfectly. Kostovic has other interesting advocacy posters as well. 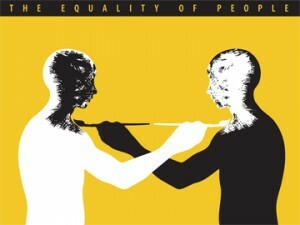 I really like this poster he ddi for equality of people as well. Next Next post: andy mangold.